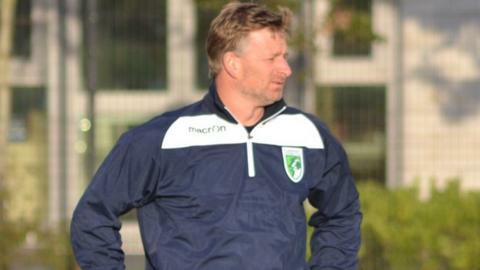 Guernsey FC manager Tony Vance says his side's defence must improve. The Green Lions have failed to keep a clean sheet so far this season and have conceded 12 goals in their last five games in all competitions. "We've been working on it, but we're just conceding sloppy goals," he said. "It's very easy to run around and say 'they're not marking tight enough', but it's coming in from all over the pitch and it's something we're very conscious of," he told BBC Radio Guernsey. "We have been working on our defence because last year defensively we were awful. "We're lucky that we had someone like Chris Tardif in goal for most of the games as he probably saves a fair few goals as well." Speaking ahead of this weekend's game against Ramsgate, Vance said there had been some signs of progress in specific areas, even during last week's 4-2 loss at home to Corinthian Casuals. "The last three or four games we've conceded from crosses from wide areas regularly, a high percentage of our goals have been from there. "So the week before last we worked on that and a pleasing stat for me is that bar the last goal (against Corinthian Casuals), because we were down to 10 men and we were 3-1 down so we had to go for it, we defended every cross, so that was nice. "We're always looking at ways to try and improve ourselves and certainly defensively we've got to up our game."